Welcome to Day #11 of the Moda All Stars All in a Row Blog Hop. 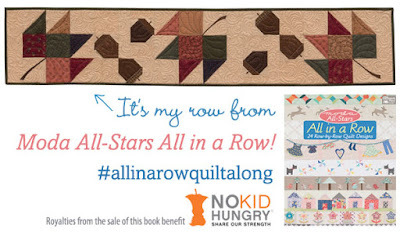 I am so proud to be part of this talented group of women who have donated their time to create unique rows for this book with all proceeds donated to No Kid Hungry. Each day of the Hop, two designers have been swapping rows to put their own twist on the other designer's row. Kaari Meng of French General and I are posting a version of each other's rows today. I LOVE her Drunkard's Path variation, but not so crazy about the curved piecing. What to do? Layered Patchwork! 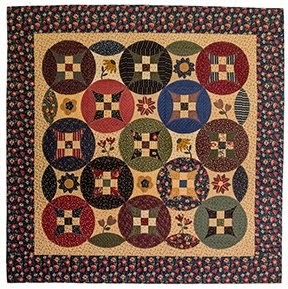 I used her template to create the quarter circles, then simply stitched them on top of the red squares for a super easy version of this delightful row. But wait! The excitement doesn't end today! Post a picture of your row(s) between now and March 15th for a chance to win some outstanding prizes. 1. Buy the All in a Row book at your favorite quilt shop. 2. Join the Facebook group #AllinARowQuiltAlong. 3. 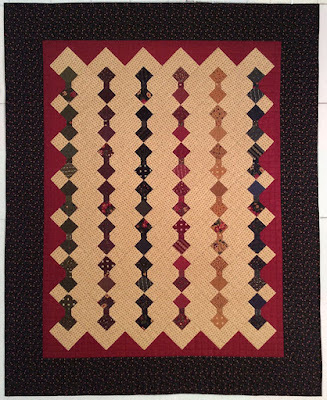 Post a picture of a row of a whole quilt top of rows - one entry for every row in your quilt. 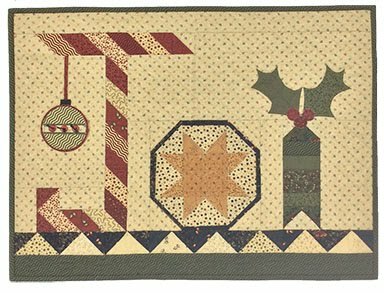 All in a Row Quilt Along Queen (1st prize) - Fat Quarter pack every month for 9 months (April to December 2016) + 2 new releae books of the month for 9 months from Martingale. All in a Row Beauty Book first runner up (second prize) -Fat 1/8 pack every month for 6 months (April to August 2016) + one new release book of the month for 4 months from Martingale. 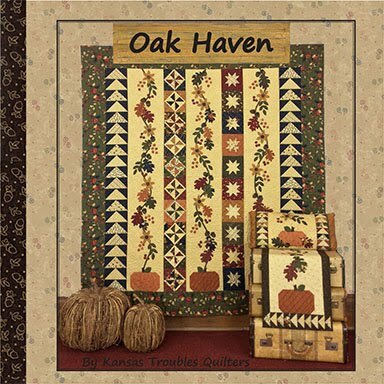 All in a Row Beauty Book second runner up (third prize) - Layer Cake every month for 4 months (April to July 2016) + one new release book of the month for 4 months from Martingale. All in a Row Beauty Book third runner up (fourth prize) - Layer Cake each month for 2 months + one new release book of the month for two months from Martingale. All in a Row Beauty Book fourth runner up (fifth prize) - one Layer Cake + one new release book for April from Martingale. Oh My Stash! I'd be stitching like crazy to win any of these fab prizes if I was eligible! Don't miss this opportunity to win big and have a great time with the Moda Designers and the All in a Row book by Martingale. I'll be following on FB and waiting to see who wears the crown and reigns as Beauty Queen on March 15th. See you all there! In addition, I'll be giving away a copy of the All in a Row book right here next week on my regular Monday blog post. Any comment enters you in my giveaway! Congratulations to the winners from the past 2 weeks of blog giveaways! Janie - I am freezing here! It is 11 degrees! Just sayin! Have a lovely trip. Thank you for the giveaway. Sandy F - I love those. Always have a hard time figuring out what to do with minis. They are so fun to buy. Maybe now I can use them! Now that I'm back from the cruise, we'll get your patterns sent right out. What a wonderful time Jenny and I had with a great group of gals. 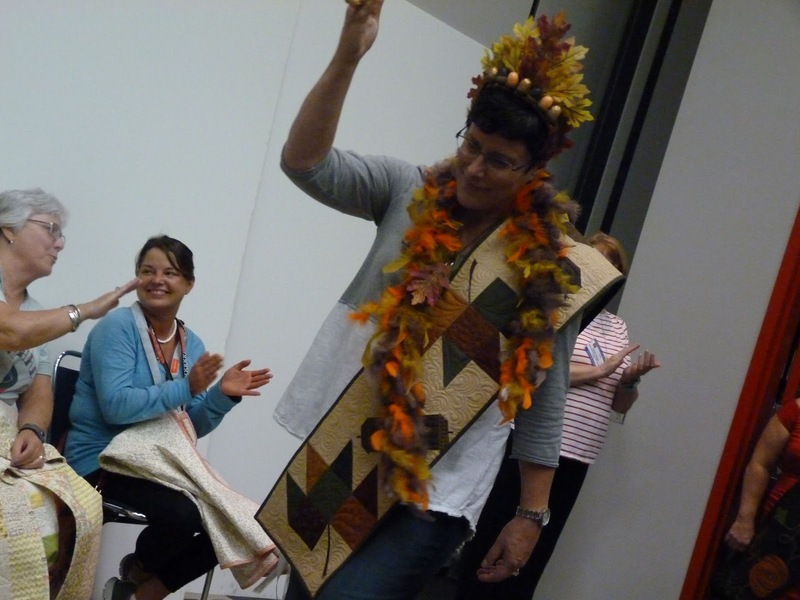 Eighty quilters joined us for a week of stitching, sunning, relaxing, playing and delicious food. I'd forgotten how fun the formal nights and casual days are on a ship. Can't wait to do it all again in April! I'm so excited you've joined me for my first KT Stitch With Me series. Today is our first day of piecing together a mini charm sampler featuring my layered patchwork technique. The Crazy for Minis book has 6 simple projects using mini charms with several additional home decor bonus projects. 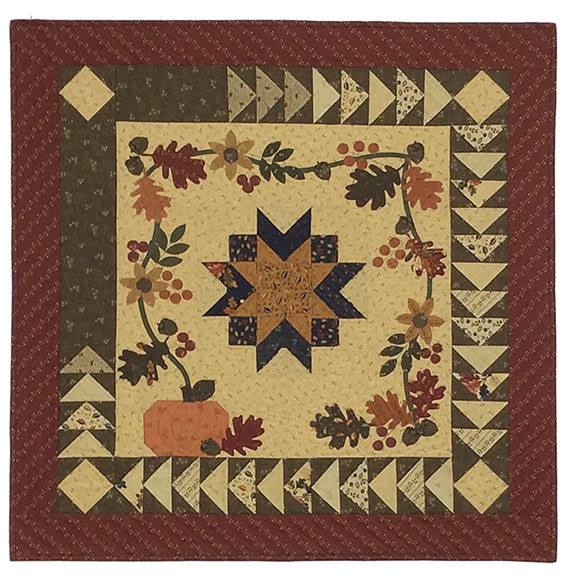 Jamie finished printing it while we were gone, so we wanted to give you a sneak peek at some of the blocks we redesigned for easier, more perfect piecing. 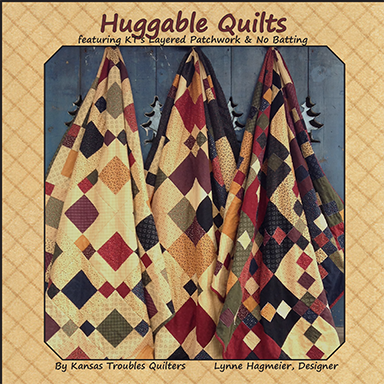 By the end of the series, you'll be a pro at layered patchwork and ready to whip up any of the projects in the book. First up, this floating layered star. 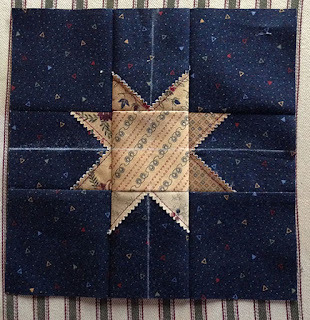 When stitching tiny pieces, especially with points, it's difficult to keep the star points from being cut off in the seam allowances. My solution? Extend the background so the star floats! It's also a great way to add size to your block so it will fit an odd dimension in a design plan. 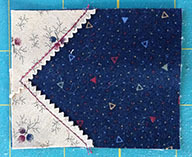 I chose 2 KT Mini Charm packs from two different fabric collections for more variety, a tan tone-on-tone print for the background, a navy small geometric print for the star background, a red tone-on-tone for the 1st border and a green print with multiple colors for the outer border.It's not too late to call KTQ for a kit - 785-488-2120. 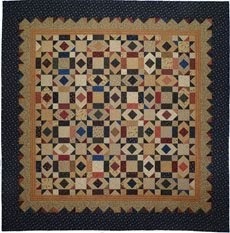 CUT: Tan Mini Charm (MC) - A - (1) 2 1/2" sq. Navy - C - (4) 2 3/4" x 2 1/2"
D - (4) 2 3/4" sq. 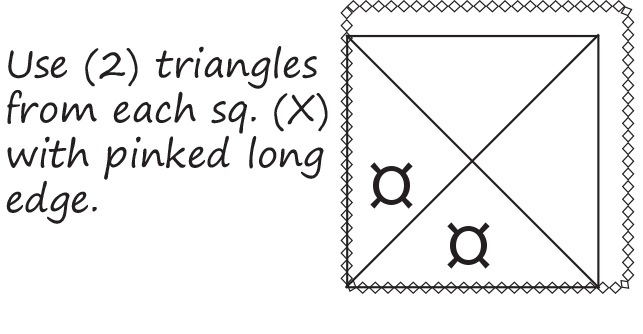 Follow the diagram below to trim and cut (4) tan mini charm (MC) squares. Cut 1/4" from two sides, then cut the remaining 2 1/4" sq. twice diagonally. 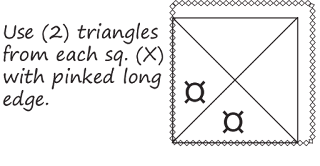 We'll use the (2) triangles that still have the long side pinked, indicated by the circles. Why, you ask? Because the pinked edge is on the straight grain of the fabric and keeps it from unraveling. It will be the exposed edge for the star points. If a square cut just once diagonally would work for this block, the cut edge would be on the bias and it wouldn't need to be pinked. 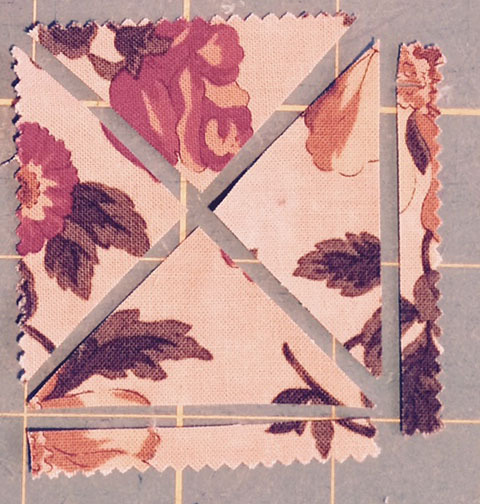 Rule #1 of Layered Patchwork - exposed edges need to be either pinked or cut on the bias. How to cut B tan mini charm squares for star points. 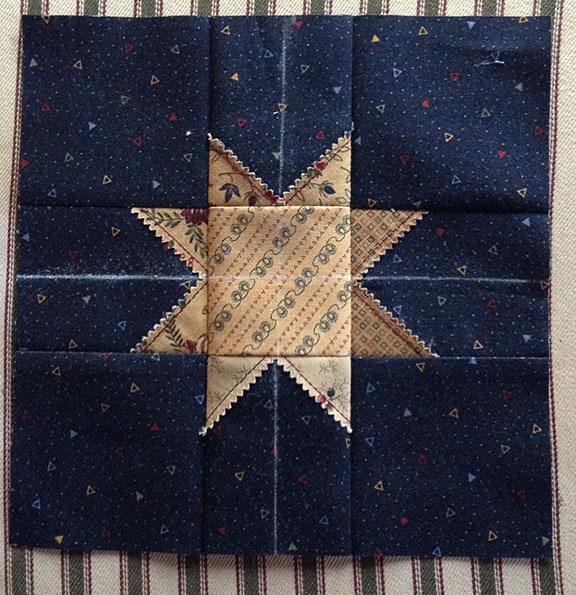 Now that all of our pieces are cut, we'll lay out the background of the star in a 9-patch with the D-navy 2 3/4" squares in the corners, the C-navy 2 3/4" x 2 1/2" on the sides, and the A- tan 2 1/2" MC in the center. On each C-navy rectangle, position (2) of the B-tan triangles, right sides up with corners aligning and the center points overlapping, right over left; glue in place. I like a good quality fabric glue like Sewline (see in above picture). The slender design and small tip make it easy to use and it's refillable! Put a dot of glue on the tan star points, especially where they overlap, to keep the triangles from scooching (yes, it's a word) when stitching. I used red thread so you can see the 1/8" topstitching better. My choice is Aurifil 50wt. tan#2370 to blend with most KT tans. 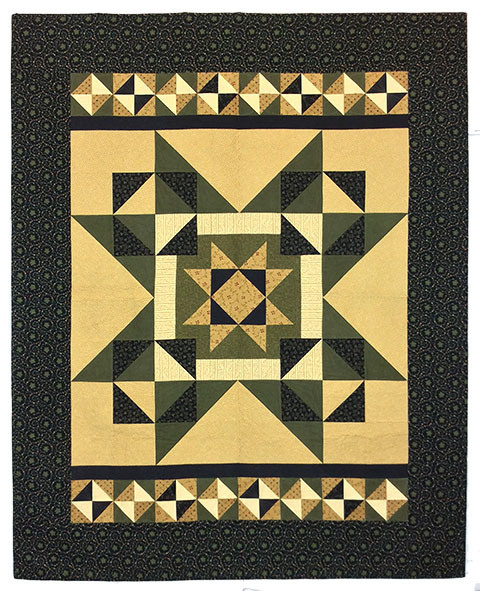 Stitch 4 star point units.Make each star point using matching tans or mix it up for a scrappier look. Return star point units to 9-patch layout. 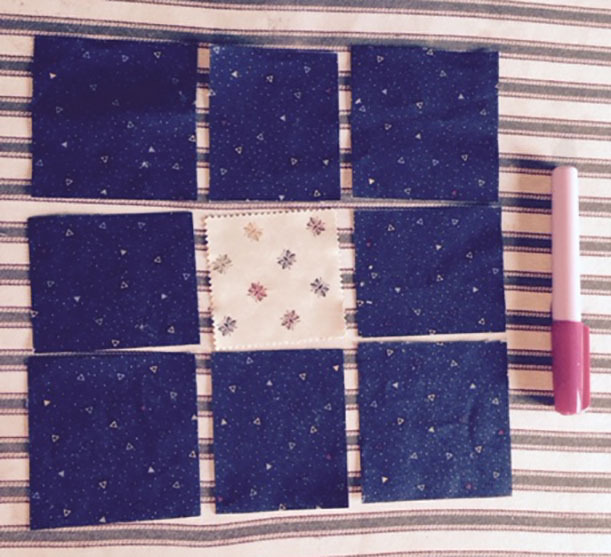 Sew block together in rows; press top and bottom rows toward corners, press middle row toward center tan square. 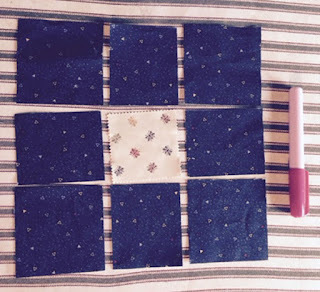 Sew rows together; press all rows in one direction. Star block measures 7" square. Trim your block to 6 3/4" square using a square ruler. Draw a chalk line thru the center of the star at 3 1/2" in both directions. Align the 3 3/8" lines on your ruler with the chalk lines; trim the excess navy from two sides. Turn block around and trim remaining two sides. The Floating Star block now measures 6 3/4" square. Great job, ladies! Wasn't that easy? Perfect star points every time. Comment on making this block to win a copy of Crazy for Minis. 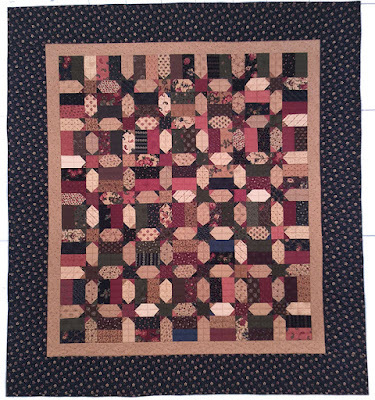 Hope to see you again next Monday for the next block in our MC Sampler quilt. Do you have a KT Spare Change ruler? It's not required, but you'll love how it makes the next block even easier. 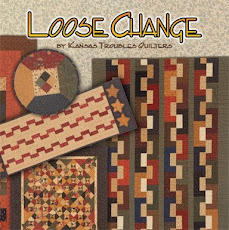 Special blog offer for Spare Change ruler - Retail $8; sale price $5. Orders over $20, including Spare Change ruler, receive free shipping! 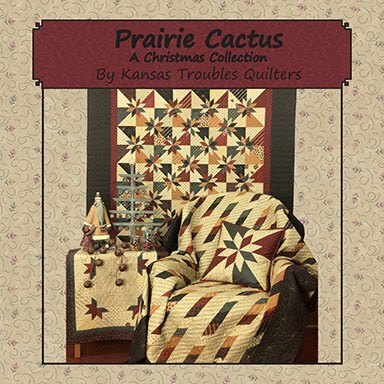 Go to our website at ktquilts.com today to make your list, then call KTQ to place your order. The website will not have the ruler on sale or the free shipping offer. It's a secret sale JUST FOR YOU! Call Jamie or Robert today at 785-488-2120 and they'll send your Spare Change ruler right out! Sign up to receive my blog posts automatically each time I post so you don't miss a thing! Are you following the Moda All Stars All in a Row Blog Hop??? I'll be here January 28th along with Kaari of French General to share our rows. Check back for a chance to win the All in a Row book. 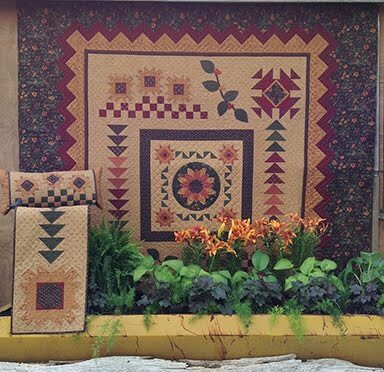 Go to Lisa Bongean of Primitive Gatherings and Joanna Figueroa of Fig Tree Quilts for today's posts! As you read this, Jenny and I will be cruisin' somewhere in the Caribbean, hanging out with 80 quilters who are as passionate about stitching as all of you. It's a unique experience to quilt and play while working with some of the warmest, giving-est people out there. Quilters are a truly unique breed in this crazy world - grounded, generous, positive. 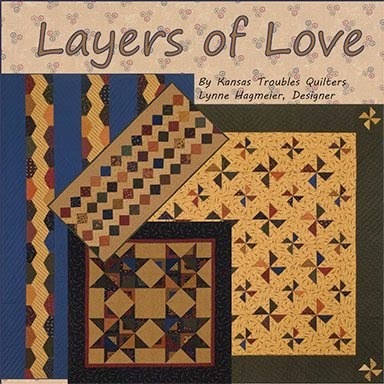 It's not unusual for someone in a class to need a piece of fabric and half a dozen quilters jump up with just what they need, so willing to share. How many groups of people respond like that! It's a pleasure and an honor to get to know each and every one of you. I wish you could all come with us. Wait - actually, you can! Our cruises for April 2016 and January 2017 are filled, but you can contact The Cruise Lady (seriously, that's her email address) to sign up for future events. Not a water lover? 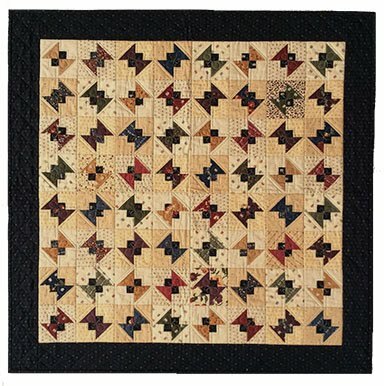 Join Jenny and me in the mecca of Missouri Star Quilt Co, Hamilton, MO, August 25-27 for a 3-day retreat. Space is limited so call Missouri Star today for more information. Never cut off star points again with our KT's Layered Patchwork technique. A great addition to your home decor in about 3 hours featuring KT's Wedge Template. Don't forget! My tutorials at Craft U begin today! 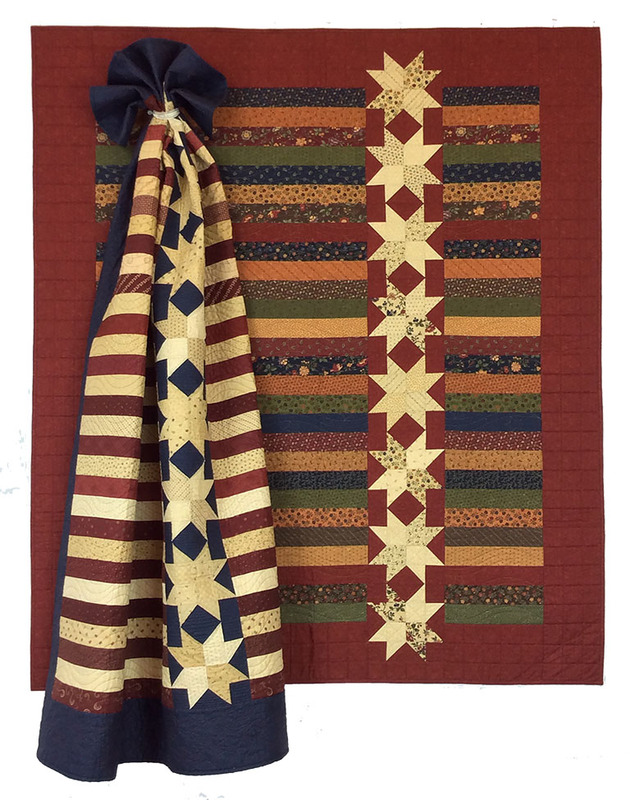 If you've followed my blog and wanted to learn - step by step - what my Layered Patchwork technique is all about, this is the perfect opportunity to follow along. 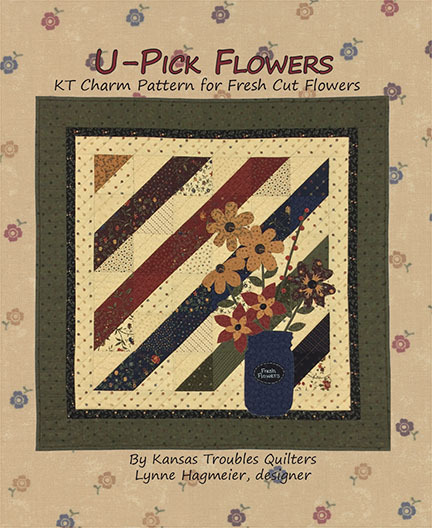 There are 3 separate projects - Kansas Sunflower, Mini Barn Raising and Window Garden - only available thru Craft U. Use the coupon code PATCH5 for a $5 discount on the class! Comment here to win the exclusive cruise patterns, above, and feel almost like you're there! Congratulations to Carol Feye! You're the winner of this week's Huggable book. 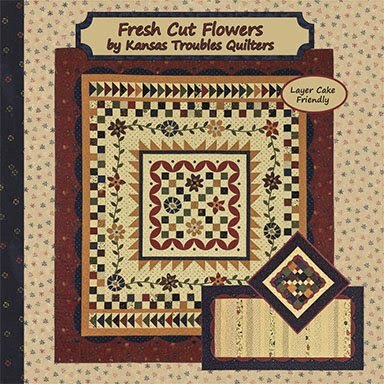 Please email Jamie at lynne@ktquilts.com with your mailing address. She'll send your copy right away. 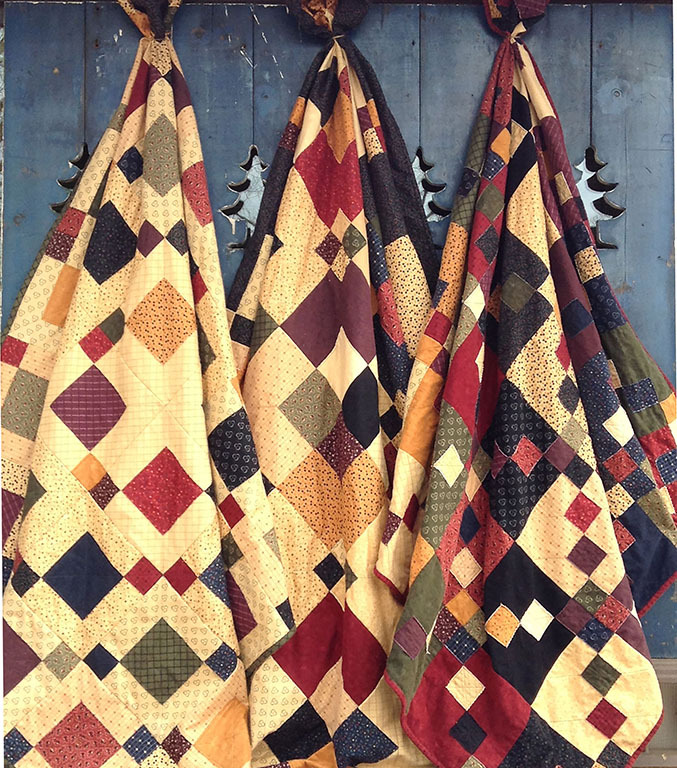 We'd love for you to share your cuddly, cozy quilts with us, too! Join me January 25th thru February 22nd right here at this blog address. 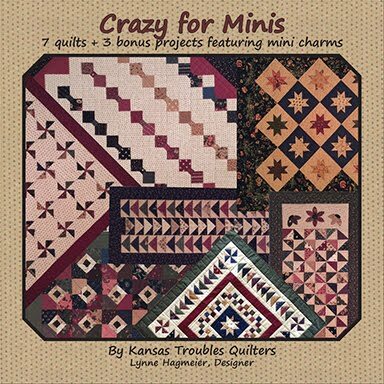 I'll be sharing tips and techniques for my Layered Patchwork method featuring Mini Charms to introduce you to some of the blocks used in my new book, Crazy for Minis. Grab a couple mini charm packs, a fat 1/8 each of red and navy, 7/8 yd. of a tone-on-tone tan background and 1/2 yd. of green (or your choice) for border/binding and you'll be ready to Stitch With Me! 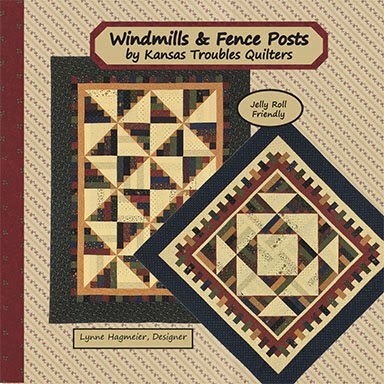 Call Jamie at KTQ if you're interested in a kit (785-488-2120) I'll see you then! Crazy for Minis will be ready by the end of January so pre-order your copy today! Here are a couple of the fun and easy projects included in this new book featuring mini charms and our layered patchwork method. They all go together sooo quickly you can make multiples for gift giving. 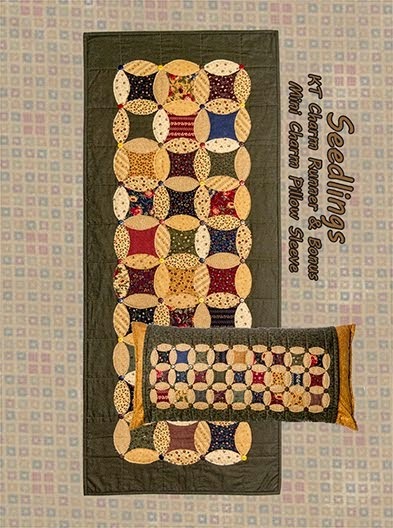 Summer Breeze mini quilt and pincushion - love those buttons! Comment here to win a copy of Crazy for Minis. Winner will be announced Jan 25th. Now I need to go finish packing! The leftovers are long gone, the tree and decorations are carefully stored away, and the house is almost back to normal. At the store, the fabric, patterns, spools of thread and wool have all been counted. I've finally caught up on my sleep after a hectic week of kids and grankids coming and going over Christmas break. Now, to look forward to all of the exciting things happening this year at KTQ. 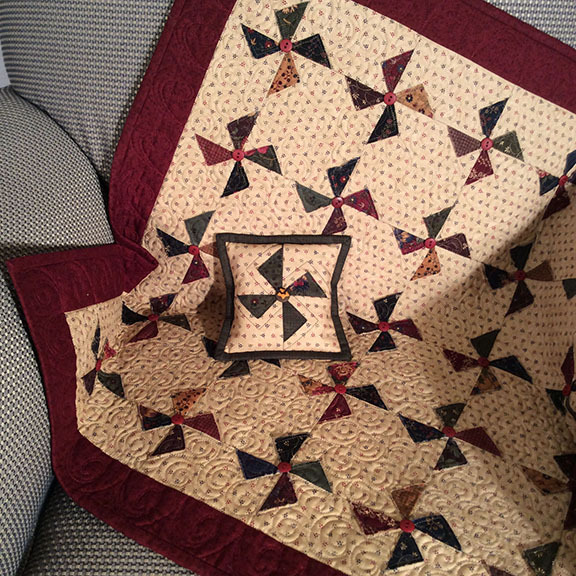 Robert and I are kicking off our year with a quilting cruise with Jenny & Ron Doan of Missouri Star Quilt Co next week. It's our first adventure together and I can hardly wait! Our host for the quilting cruise is Flash Sew and Quilt in Naples,Florida. If you're interested in joining us in the future, stay tuned for more information later this year. 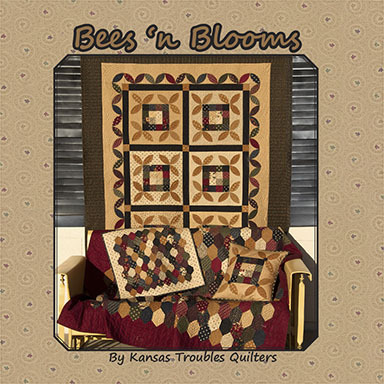 Cyn -"Flannel for Kansas winter days and in your colors. The video I enjoyed the most was the Barn Raising. I have always wanted to do a barn raising quilt, however, didn't like the thought of all that piecing. Your method makes is so super duper easy. 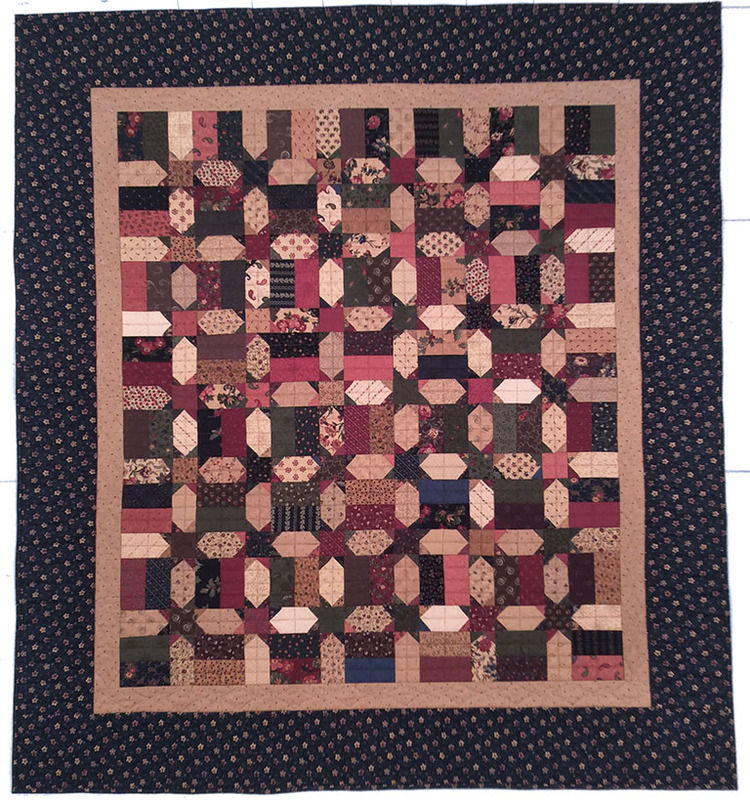 On my quilting to do list is now a Barn Raising Quilt." Thanks for watching my videos and commenting. 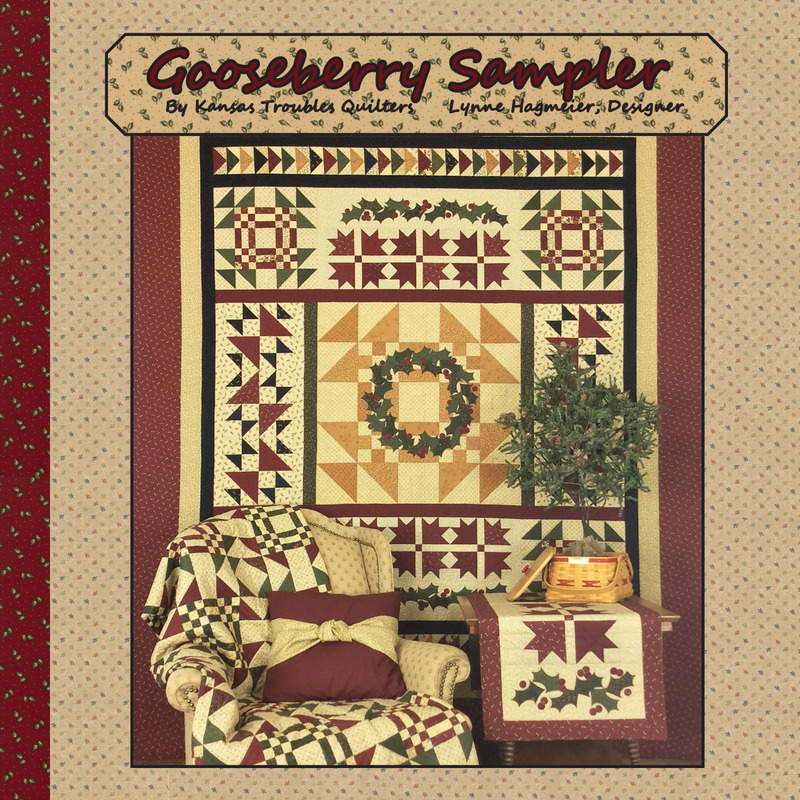 You've won a bundle of Cozy Cottage Flannels scraps! 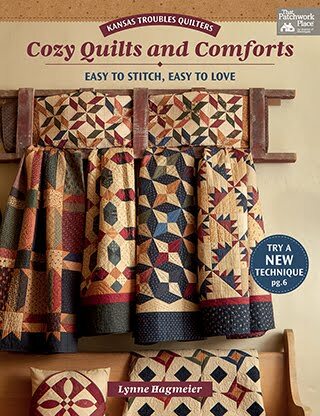 I'd love to see what cozy quilts you create. 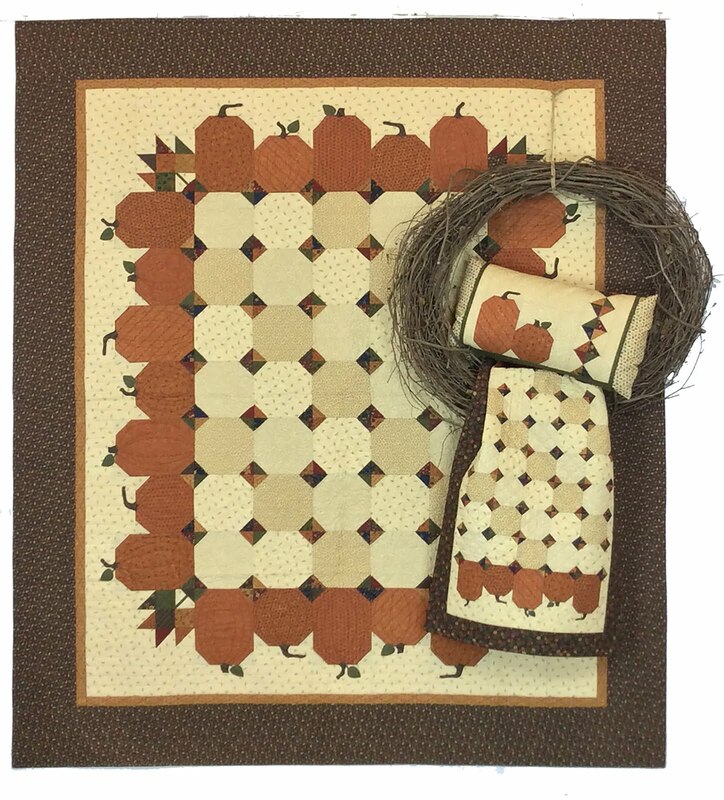 Check our ktquilts.com website for newly posted Cozy Cottage Flannels Layer Cakes and Charm Packs to make totally cuddle-able quilts from our new Huggable booklet. 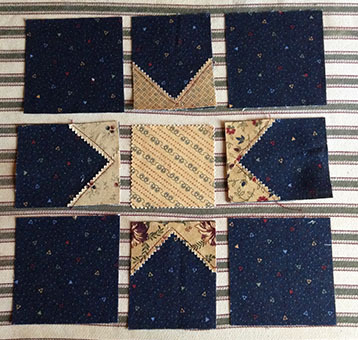 Each of the 3 projects is simply LC squares laid back-to-back with charm square embellishment stitched and quilted. 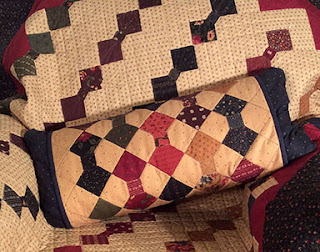 The layered squares are then sewn together with exposed seams on the back - no batting needed! They're so soft, a great weight and very snuggly. My grankids have already requested them for Christmas next year! Comment here for a chance to win the Huggable book. 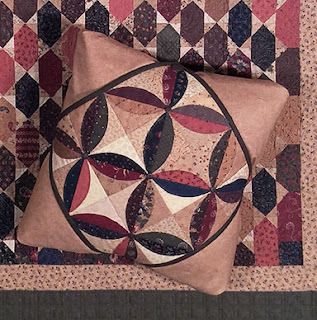 Craft U Layered Patchwork Tutorial begins January 18th. I'll be cruisin' but we can visit via email about the projects when I get home. 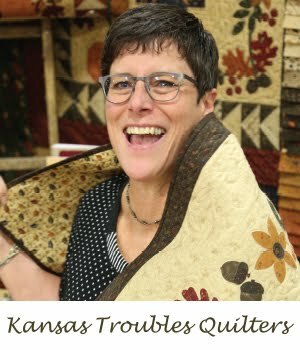 KT Stitch With Me begins January 25th thru February 22nd right here at this blog address. I'll be sharing tips and techniques for my Layered Patchwork method featuring Mini Charms to introduce you to some of the blocks used in my new book, Crazy for Minis. Grab a couple mini charm packs, a fat 1/8 each of red and navy, 7/8 yd. of a tone-on-tone tan background and 1/2 yd. of green for border/binding and you'll be ready to Stitch With Me! 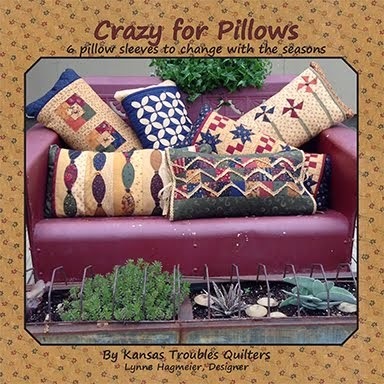 Call Jamie at KTQ if you're interested in a kit (785-488-2120) I'll see you then!